Once employee and now owner Joanna Hanna has been a part of CMB for over fifteen years. Born and raised in Pennsylvania, Joanna and her husband, Shan, moved to Eureka in 1976. A graduate of the Maryland Institute of Art, Joanna has always been a multimedia artist. Working with beads became a passionate artistic outpouring for Joanna, and now her beautiful pieces show the life of a working artist. Her acrylic and wood painted pieces can also be found adorning the walls of Crescent Moon Beads. She works with her daughter Michelle Fitzsimmons, and family is a big part of Joanna’s life and art. Joanna strives to “stay relevant,” as she puts it. Working every day in pursuit of the art she loves, her jewelry is not her work; it’s her passion. 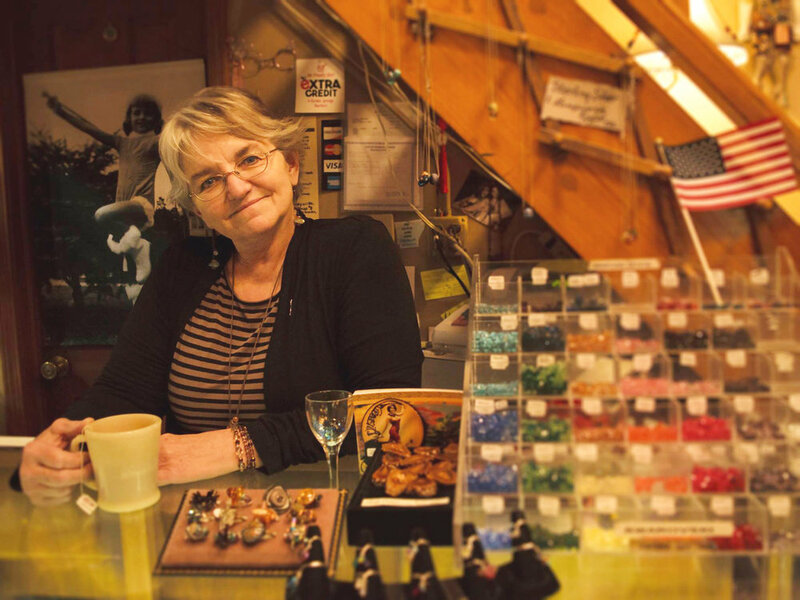 Established in 1994, Crescent Moon Beads has been a staple of downtown Eureka Springs for many years. Beads, tools, custom jewelry, and beading supply have been a part of the shop from its beginning. The ever-expanding selection of crystal, gemstones, metals, wood, ceramics, and much more serve our local and traveling customers something we hope is special and unique. Helping others create designs themselves or designing something special just for them is a quality we hold dear. With every person we meet and every piece we create, our goal is to provide a creative and loving environment. We make pieces that are current and one of a kind, mixing imagination, technique, and love into every inch of our work. We are Crescent Moon Beads.